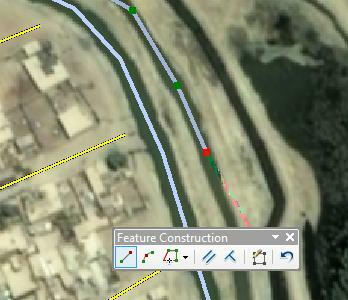 Home Uncategorized ArcGIS 10 – Turn Off the “Feature Construction” toolbar. ArcGIS 10 – Turn Off the “Feature Construction” toolbar. I’ve been doing a lot digitizing recently and for the most part ArcGIS with version 10 is finally a viable way of doing it. There has been one thing bothering me though and that’s the “Feature Construction” mini-toolbar. It pops-up as you edit but more often than not it’s been getting in my way. Get out the way! ARGHHHH! So I did some searching in the help file and wouldn’t you know it I can turn the toolbar off or better yet with one key move it. There are so many keyboard short-cuts and functions in ArcGIS I can’t honestly keep track of them. But with this I’m a little embarrassed I’ve gone on so long without finding out how to get rid of the damn thing. So to move the mini-toolbar with press TAB to move it or SHIFT+TAB to remove it from your site. Or click on Editor –> Options and under ‘General’ uncheck the “Show minitoolbar” option. Stupidly easy isn’t it? Well first of all there is a lesson here, check the help file if you can’t figure it out. I also did at the same time a google search which got me to a new blog I hadn’t been to before! blog.donmetlz.com – “ArcGIS 10 Annoyances – Feature Construction Mini-Toolbar” –> Lots of comments on the end of this post, shows me that I’m not alone in my ignorance of this ‘feature’. Previous articleThe awful mess of Local Plan Maps online. You’re welcome, glad the post was useful to you! So glad you posted this, after spending about half an hour going through ESRI’s “help” and finding nothing I was getting desperate! Wow, and I have been living with this annoyance for how long. Thanks for the tip, I shared it on the SHRUG (Seven Hills Regional Users Group) email list group. Thank you SO much. That irritating little toolbar was draining my productivity. Spent too much time moving it out of the way. This makes me so happy! Thanks. Now I can work in peace. Thanks. Thanks! That stupid toolbar was driving me nuts! THANK YOU SO MUCH! I hate that stupid toolbar. Thank you sooooooooooooo much. As mentioned by Myke, I too spent so much time moving that miserable little toolbar. Too bad the help can’t be setup more like an internet search. Far faster to get answers off the internet then the ArcGIS help. thanks so much mate!! that was starting to be just a little more than simply inconvenient.. cheers!! Wow, that truly saved my life! Thank you very much!!!! Whoo thanks this has irritated me for a while so i decided to google it and found your website.